28S-WAW-120 this is a “28Standard” 4Ground model with high detail and pre-painted parts. This Polish Rural Cottage is a great example of a building type found in the middle and eastern parts of the ‘Great European Plains’. This type of single storey rural vernacular construction could be found from the German Polish low lying borderlands, right across Poland, Belarus, Northern Ukraine and much of European Central Russia. 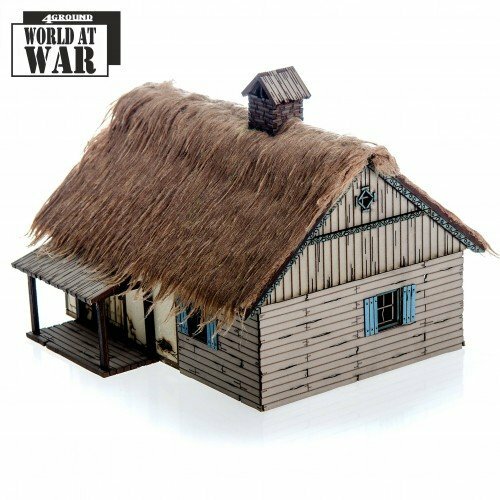 Although this Rural Cottage was designed for our World War 2 range it would be perfectly suited for any conflict in these regions of Europe from the Napoleonic period onwards. This building has a wattle and daub exterior, which is part covered in clapboarding. It comes with customisable plaster damage and also includes card shutters for the windows. Internally the building has working doors and an oven.